On average, Google processes 40,000 search queries every second. That’s 3.5 billion searches per day, and 1.2 trillion searches per year, worldwide. What major shift have you made in your business to generate traffic to your website? The reason I ask you this question, is because I went through a huge change in my business, and because of going through this, I was truly able to understand how to steal customers, generate more traffic to my website and generate more leads and sales. This change was a digital transformation. For the last three years, I have researched and analysed my industry, competitors and customers to understand what they wanted from me. The tools I used to market by business, and the various marketing techniques stayed the same, but the way I connected with my audience had changed. During this process, I realised, and understood a number of key moving parts to a website that when they are working like clockwork, do give you that boost in traffic to your website that you are looking for. For this article, I want to highlight eight tips on how to steal customers with google in 24 hours. The eight tips relate to different moving parts to a successful website, how they can negatively impact your business online and a simple solution so that you can drive that much-needed traffic back to your website. 1. Do You Have A Website Plan in Place? Imagine you are opening a high-street store, or a restaurant. When going through the building process, do you just “go with the flow” or do you have a solid plan in place of how you want everything to look? Hopefully, you would have a plan in place for not only the build and structure of the physical location, but moving forward with the products you are going to sell. Take this scenario, and apply it online. There is no difference between building an online store, or a location-based business. The same rules apply (in my opinion). If you are going to invest your time and energy into building a website, you need to have a plan in place. A website is always a working process and I have realised this over the last three years in particular since launching thinkdigitalfirst.com. 2. Is Your Website Responsive? 80% of Social Media searches are now conducted through mobile, as well as 60% of all online searches. Your website is the hub for your brand’s identity online and the importance of offering a seamless experience to a potential prospect regardless of the device they are using is absolutely crucial. I remember a time when having a “responsive” website was an expensive ask, and something that website builders were not offering and so it was somewhat of a taboo subject. So, when you visit your website via a mobile, or tablet device, are you getting the same seamless journey that you experience when viewing your website on a computer or laptop? If the answer is no, you need to make a change, and it could be quite an expensive one. It has however, become a lot easier especially if you are using a website builder like WordPress, as they now offer a large number of engaging responsive templates. If you had your website created by a website designer, explain to them the importance of having a responsive website, and make it a priority. 3. Is Your Website Generating Backlinks? When you visit a website, and you see a link to a secondary website, this is what is called a backlink. That secondary website will gain extra brownie points by having content on another website, linking back to it. Backlinks used to be the most important search engine ranking factor when it came to sitting on the first page of a search engine for search results. Backlinks are still so important, but their value has changed, and this can work to your advantage when looking at how to steal customers with Google. Link Juice: a webpage that links to your website is deemed “link juice”. This will help with with content ranking. No-Follow Tag: This is a link to a website that does not contain “link juice”. This is usually done when linking to an unreliable site. Do-Follow Link: This is the default setting for all links in blog posts, and do contain “link juice”. Linking Root Domains: The number of backlinks coming to your website from a unique domain. Regardless of the amount of links, it will only count as one linked root domain. Low-Quality Links: These links come from automated sites, spam sites, and harvested sites and do a lot more harm than good. Anchor Text: Otherwise known as a hyperlink and are used to help rank for a specific keyword. Having high-quality do-follow links will generate that link juice you need, and if this is something you do not currently have, it could be one of the biggest reasons why your website is not generating the amount of traffic you would expect. Monitor Backlinks is a great website for you to check all of your backlinks completely free of charge. If you find that you do not have as many backlinks generating link juice as you thought, here is one simple way to change this; blog commenting. Find an industry specific high-ranking authoritative website that encourages comments and a community environment so that you can leave a worthy comment, with a link back to your website. Guest-blogging is another great way to generate high-quality backlinks. 4. Is Your Blog Content Engaging Unique And Relevant? 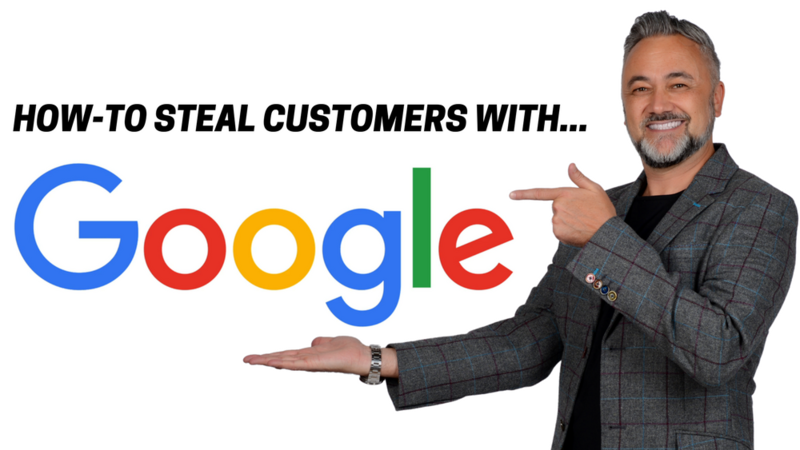 One of the best ways that I have personally generated hundreds and thousands of website visitors is through the content I create, and this is one of the best tips when it comes to looking at how to steal customers, and get on the first page of Google. I have been nominated for, and won various awards for the content I create both on my warren-knight.com website, and thinkdigitalfirst.com website. The content I create is one of the biggest attractions to both of my websites. If you haven’t already, install a social shares plugin/widget to your website. Allowing your audience to go and share your blog content with their audience will bring organic traffic back to your website. It may take you a long time to find the perfect type of content for your target audience, but it all starts with research, and an understanding that the content you create has to be relevant, engaging and unique. Short paragraphs (nothing more than five lines long). 5. How User-Friendly Is Your Website? All of the above contribute to a negative website visit, and in turn, results in a high bounce rate (where someone only visits a specific page on your website, and leaves before navigating elsewhere). There are a number of different tools you can use to make simple fixes around user-friendliness. If you have a wordpress website, have a read of a recent article I wrote around plug-ins that will help you achieve a seamless website experience. 6. How Up-To-Date Are Your Keywords? This is where it gets slightly more complicated. Defining your keywords, and actively using them on your website is a sure-fire way to get a big thumbs up for search engine ranking, but it’s not that simple anymore. The more businesses that start using certain keywords as a way of driving traffic, the less likely you are to rank for them because the competition is so high. Regardless of whether you have the best content or not, authority outweighs this every time. This means that more common one-word, or question keywords around popular subjects are almost not worth look at, so you need to do your research, and really listen to your target audience. How are your target audience searching for your products/services online? They won’t be using a one-word search term to get specific, they will use more words, and this is where you capitalise on long-tail keywords. Doing all of the above, plus using long-tail keywords will help you generate the website traffic you are looking for, and achieve the ultimate goal of understanding how to steal customers. 7. Are You Promoting Your Website Online? Regardless of whether this is inside of a Facebook, Twitter, on a forum or at an event/tradeshow, think about how you interact with your audience and the way in which you share your content that sits on your website. You have an arsenal of amazing marketing tools across the board including Social Media, so use them to your advantage and always track the content linking back to your website to measure what is getting the most engagement. Asking your audience questions can give you a 162% increase in interactions, and the more you interact online, the more likely you are to increase your website traffic. 8. Are You Promoting YOU Online? My final question to you, is around becoming an influencer online, and building YOUR authority online, that will in-turn help your website grow. As I have evolved as an entrepreneur, I have realised that I have become more personal, and have shared more of my life with my audience than most other influencers I know. Doing this has definitely contributed to becoming a top 100 digital influencer because people buy from people, and having my own unique and personal tone of voice has definitely heightened my engagement, and increased my reach, and website traffic over time. Every single company that connects with their customers online that has a website and a successful marketing strategy will have their own tone of voice that connects with their customers. People will always buy from people, so your brand has to have emotion, and a personality which they can connect with and relate to. How do you feel after asking yourself the above eight questions? As a business, having a website is crucial to your success and I am going to share with you the importance of this, and how to create a website that will turn your visitors into prospects and help make your business a success. Find out, in just 60 minutes my formula to creating and running a website that tells a story about you and your brand and is not only good to look at but is functional, effective and meets important goals like increasing web traffic and visitor conversion rate. 44% of website visitors will leave a company’s website if there’s no contact information or phone number. You can sign up to access the recording below!